The only saw teeth with extra cutting tips. Field testing has shown that Gator Teeth® last significantly longer and cut significantly better than competitor teeth. The secret of their long life is due to 4 extra carbide cutting tips for a total of 8 carbide tips per tooth sharing the work of cutting, thereby keeping their cutting edges sharp longer. Operators have also noticed Gator Teeth® “don’t drag the saw down as much and stay sharp longer”, resulting in better cutting efficiency for a longer period of time. This better cutting will help loggers’ bottom line with increased productivity and fuel savings. Gator Teeth® are also impact resistant. 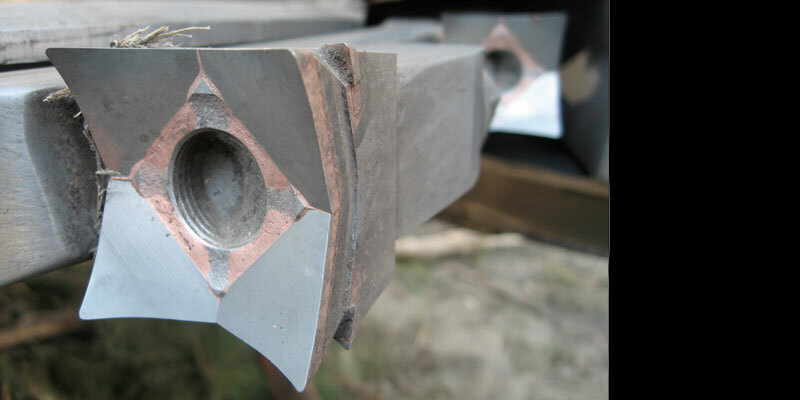 Operators have commented that the second cutting tips are not damaged after hitting rock leaving the teeth “still cutting smooth” and avoiding maintenance & downtime. Gator Teeth® are designed to fit Tigercat, Waratah, Timberjack, John Deere, and Koehring saws.